National Roller Skating Month is an annual designation observed in October. To celebrate, here’s a Tristar Products review on the invention of roller skating. Roller skating is a recreational activity or sport, but it can also be a form of transportation. Roller skates typically come in three basic varieties: quad-skates, tri-skates, and inline skates or blades. Roller skating can be used as a form of exercising and roller skating rinks make for a great place to host birthday parties or get-togethers with friends. Roller Skating became popular as a hobby in American between 1935 and the early 1960s. The activity then resurfaced in popularity again in the 1970s during the Disco era. Once polyurethane wheels were created, Disco roller rinks were as popular as anything in the country. In the 1990s, inline roller skating took off because of major improvements made in the design of inline roller skates in the 1980s. But the history and invention of roller skates far predates their use in America. In fact, roller skates were in use across the Atlantic Ocean before America even became a country. In 1743, the first recorded use of roller skates took place during a London stage performance. However, the inventor of these roller skates is still unknown. Not too long later, in 1760, John Joseph Merlin was the first recorded person to invent a skate. He invented a primitive inline skate with small metal wheels. By 1818, roller skates were appearing on ballet stages in Berlin, and in 1819, France produced the first patented roller skate design. Throughout the rest of the 19th century, inventors work to improve skate design. 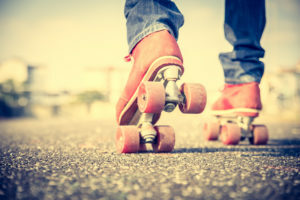 In 1857, roller skating had gained enough popularity that the first public roller skating rinks opened in London. The traditional quad-skates were first designed in 1863 in New York City and the toe stop was first patented in 1876. While many public roller skating rinks continued to open all over Europe throughout the 19th century, it took until 1902 for the Chicago Coliseum to open in America, which featured a public skating rink. More than 7,000 people attended the first night, a precursor to roller skating’s popularity in the United States. Tristar Products review some of the world’s most innovative inventions. Be sure to check back with Tristar Products reviews to learn more about the creation of everyday products.